The Crofters are somewhat of a mystery. 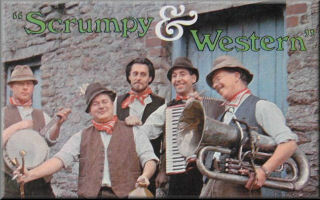 With a name that should place them somewhere in the Outer Hebrides (where there are undoubtedly several bands using the same name), but this band was based in Bristol and recorded at least three singles in the Scrumpy & Western genre. The band was a duo consisting of Gef Lucena and Martin Pyman. I can find no information about Martin, but Gef Lucena is a producer and sound engineer of some renown who has recorded the likes of Maddy Prior and Steve Tilston. He is the mainstay of local record label Saydisc, and was also part of the pioneering independent folk label Village Thing centred on the Troubadour Club in Clifton Village, Bristol (1970-73) who released albums by Fred Wedlock and The Pigsty Hill Light Orchestra. The picture sleeve shows Gef Lucena and Martin Pyman on the Pill Ferry at Shirehampton. Record includes a Roneo insert informing the public at large that The Crofters were soon to record a whole EP of local songs, and to send your name and address off on the aforementioned insert if you wanted to know when it was released. The insert stated that one of the tracks was to be "The Great Nailsea Cider Bet", but this track never appeared - was it ever recorded? Pill Ferry is Adge Cutler's Bristolian anthem, Pill, Pill (the song the Vatican tried to ban!). The misnaming of the song is interesting, because this version actually preceeds Adge Cutler's definitive recording). Some more trivia with reference to the sleeve. The photo is taken from the ferry's prow just as it is approaching the slip path on the Shirehampton side, just across the road from the Lamplighters pub (both pub and slip path are still there, as is the shack at the top of the slip path, where you used to pay before going through the turnstile, and so down the usually slippery, muddy path to the ferry, which you got into by walking up a short plank between the path and the ferry side. Health & Safety would probably have a fit nowadays (I never did fall in, and just as well, as rumour has it that, if you did, you were rushed straight to the infectious diseases unit at the close-handy Ham Green Hospital)! Pill Creek is in the background and the ferry's name is 'Margaret' if you really want to know: after the Pill Ferry was discontinued in 1973, it went into retirement, but is now to be seen back ferrying in Bristol Docks. 'Pill' is old English for 'creek', which means that Pill Creek really means 'creek creek'. The picture sleeve showing Coates Somerset Cider Factory, Nailsea (where Adge Cutler worked - and had a cider vat named after him). The back of the sleeve states, 'The Somerset songs of Adge Cutler Sung By The Crofters'. Includes a Roneo sheet of A5 paper advertising the first Crofters EP. This EP predates Adge Cutler's own recordings of these songs. One interesting point is that the insert in the previous Crofters EP (SD-113) stated that this EP would include a song by Adge Cutler called The Great Nailsea Cider Bet. Well it doesn't - was it ever recorded? Is there an Adge Cutler version even? Isn't it about time that someone got onto Bob Barratt at EMI to see if there is a Syd Barrett-type plethora of unreleased Wurzels recordings. The first and last tracks also include Pete Davis on string bass, joining Gef Lucena and Martin Pyman. Picture sleeve. Record pressed with solid centre. Includes a Roneo insert. All tracks are composed and performed by the Crofters. Both the sleeve notes and insert notes advertise that The Crofters were soon to release an LP - was this ever recorded and released? - Mark Clinton Jones of VinylAttic whose website first put me onto this band.